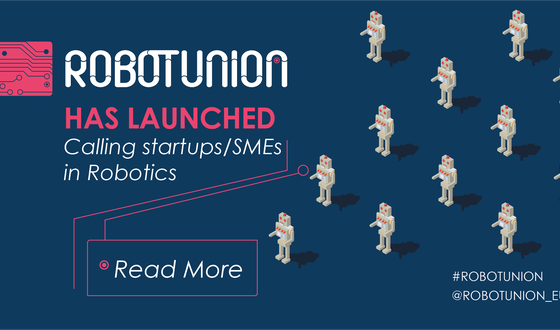 RobotUnion, the pan-European acceleration programme related to the robotics industry, has launched its first call with 8 million Euros equity-free funding for startups and SMEs. RoboValley is a partner of RobotUnion. Through this call, RobotUnion will select 20 startups that will develop projects in the field of robotics linked to agri-food, healthcare, civil engineering and manufacturing. Each selected company will receive up to 223,000 Euros equity-free for its initial funding stage as well as access to technological support from European robotics experts and business acceleration services. The best performing companies participating in the programme may obtain an additional 1 million Euros of private investment in funding rounds lead by the VCs Chrysalix and Odense Seed & Venture, with the support of Blumorpho. RobotUnion aims to address the two major barriers that hinder the development and market uptake of robotics technologies: the elevated setup costs and the lack of awareness of the high potential that robotics represents for entrepreneurs and start-ups.